SQLite is a relational database management system which is contained in a C programming library. SQLite is not a client–server database engine. It is embedded into the end program. SQLite engine is not a standalone process like other databases, you can link it statically or dynamically as per your requirement with your application. The SQLite accesses its storage files directly like “my_sqlite_db_file.db” and SQLite database format or extension is “.db”. A large number of programming language is supports like C, C++, JAVA, PHP, C#, Python, GO etc. DROP Deletes existing table or database. NOTE: All the rows of SQLite database tables has UNIQUE ID as like primary ID that name is rowid. So, you can make unique id or primary id with auto increment as like you want otherwise you can use by default rowid. I am going to show a simple CRUD( Create, Read, Update, Delete ) program in PHP. I am giving the project folder name “sqlit_crud” you can make as you like. Database connection of SQLite is a simple object of SQLite3 Class. Interesting thing you no need to create the database file it will make automatically when you make an object of SQLite3 Class. So, now we made the Database Connection where $db is the handler of Object of SQLite Class. Okay, now we need to make a table into the Database. I am making a table “students” with two fields name as string and email as string and by default rowid will be the Primary ID. NOTE: No need to define the rowid into Query of Creating table. 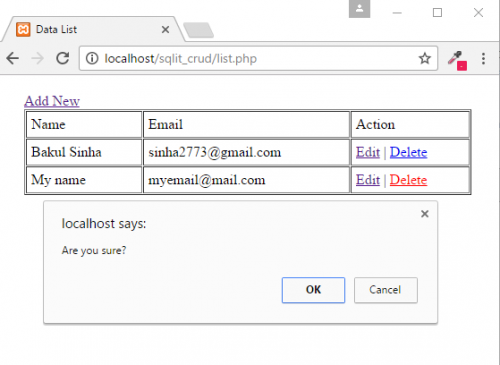 Now we need a form to insert data into table so, I am making a page “insert.php” and form in this page with post method and self action. I am checking the form is submitted or not if submitted then inserting the data into students table and setting the success or error message according to query status. Okay, now I am going to make the list page “list.php” where all the records will show. // Here $db comes from "db_connect.php"
Now I am going to show how to UPDATE the row data in “update.php”. Now going to show how to delete record from table according to rowid in “delete.php”. after saving, where this data are going? Well, If you download the source code then you will see a SQLite database “my_sqlite.db” (this is actually a file in the downloaded folder) and after saving the data are stored in the SQLite(my_sqlite.db) database. let me know if you have any confusion yet. Thanks dada…….. it is a great opportunity for me. 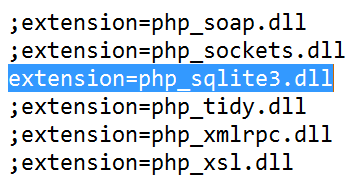 Hi Amanul Islam, You have to enable ‘SQLite3’ from ‘php.ini’. Please see on top “Let’s Get Started” section you will see there in an image. “extension=php_sqlite3.dll” this line must be enabled (to be removed semicolon at the beginning of line) for the SQLite3 extension. Comment here if you are still in the problem. 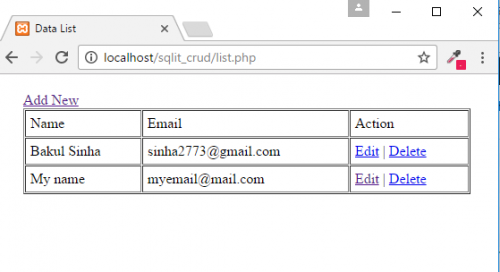 Please check the SQLite3 extension from php.ini file if it is not enabled then enabled first then try to run the CRUD. Thank you very much for sharing this! Have been putting off learning sqlite and you made it very easy to grasp within minutes. Once question if I may: Do you know of simple way to protect (encrypt) the my_sqlite.db file? Not looking for commercial strength, just to keep casual user from changing the table contents or maybe seeing what it contains. Seems like it should work with your tutorial, but just can’t seem to get things working together. Thanks for your valuable comments. Yes, you are correct I just checked your reference link it should work together. I’ll get back to you with solution asap. during last 2 days, I am tired to searching such type of tutorial. I changed the email’s input type “input” to “textarea” and tried to store large text in email field, but an error occurred. Can you please provide me the errors? Can you check your code the name attribute is correct or not. Please note if you would like to change the name attribute then you must change all query and database schema (table field name). if you need any further help let me know. same problem. please enlighten me. Could you please explain me the problem you are getting? I didn’t change name attribute. It works when i give few text input. but it can’t store a large article. bro i want to sent screenshot to you. please give me your email address. This is my email address bakul.sinha@yahoo.com. Better if possible please send me the all source codes that should be easy to be fixed the bug. In the beginning of the tutorial it says that the name of the first file is db_connection.php. – I had to change this filename to db_connect.php for it to work. I would like to ask if which is way better in storing data between SQLite and PostgreSql?